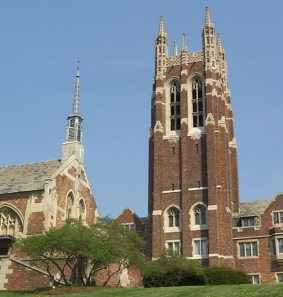 Colgate Rochester Crozer Divinity School, next to Highland Park, is a small but distinct part of the city's higher education offerings. Its beautiful campus sits on a hill overlooking the southern portion of Monroe County and its brick spires can be seen popping through their surrounding trees from South Goodman Street. The school has a very diverse Christian background and welcomes students from all faith traditions. The CRCDS offers Master of Divinity and Master of Arts degrees, as well as a Doctor of Ministry degree. There is some on-campus housing available. Other campus resources include a chapel, an expansive library and a bookstore. The school today was formed as a union between many different theological schools and its history is one of frequent addition and subtraction. In 1850, the Rochester Theological Seminary was formed in conjunction with the University of Rochester and was affiliated with the (Baptist) Colgate Theological Seminary in Hamilton, NY. The two seminaries merged in 1928 to become the Colgate Rochester Divinity School and built a campus on a large hill in southern Rochester. Campus construction was financed by John D. Rockefeller, Jr. The school opened itself to female students in 1961, when the Chicago-born women's Baptist Missionary Training School merged with the Rochester school. The Crozer Theological Seminary - alma mater of Dr. Martin Luther King, Jr. - also moved to Rochester from Pennsylvania to merge in 1970. Thus, the present name of the school was formed - the Colgate Rochester Crozer Divinity School. This was a school that welcomed students from all ecumenical backgrounds but whose roots were strongly Baptist. Bexley Hall, an Episcopalian seminary from Kenyon College in Ohio, joined the CRCDS around 1968, creating a diversity of Christian tradition to the divinity school. This school once again became an independent seminary in 1998 and is now a covenant partner with CRCDS, with schools in Chicago and Columbus, Ohio. St. Bernard's School of Theology and Ministry, formerly St. Bernard's Seminary on Lake Avenue, was incorporated in 1981 as a covenant partner of CRCDS. This school of the Roman Catholic tradition was located on the CRCDS campus until it moved to its new Pittsford campus in 2003. In response to the prospect of an under-utilized campus, the Ithaca College School of Health Sciences and Human Performance (HSHP) moved to the CRCDS campus in 2006. This school, which is primarily the physical therapy program, rented space from the University of Rochester for 15 years before the suggestion was made for the move.